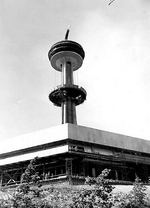 Images database - Browsing Subjects - 'Towers - Skylon' (219 found) Results limited to 100 records per page. The Niagara River forms a natural boundary line between Canada and the United States. 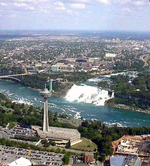 On the Canadian side, overlooking the Falls, stands the impressive Niagara International Centre Skylon Tower, while in the background both friendly nations are joined by the Rainbow Bridge. The brink of the Horseshoe Falls, with the Skylon Tower, Tablerock Welcome Centre, Sheraton on the Falls Hotel and the Rainbow Bridge in the background. A Pioneer Heavy Haul transport truck delivering the hull of a new Hornblower Niagara Cruises boat. 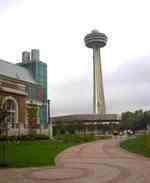 The Skylon Tower and hotels are visible in the background. Snow on the ground in front of Edgewaters Restaurant, with the Skylon Tower in the background. 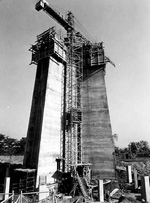 Both the Minolta and Skylon towers are visible in this shot as is the International Control Dam. Niagara Falls, Ontario Canada. 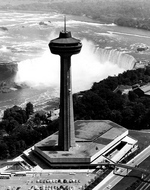 Towering above the Horseshoe Falls, the Skylon Tower soars 520 feet above the Niagara River. 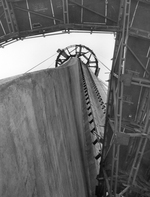 648 steps link the base with the three leveled dome. Glass enclosed elevators (yellow bugs) take the visitors to the top of the Skylon. 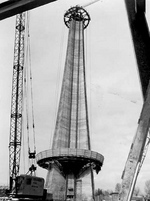 The dome's third level is an observation deck with clear-day visibility of 80 miles; the second level contains dining and cocktail lounges, while the uppermost level houses the renowned revolving dining room. 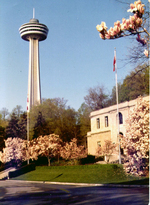 Queen Victoria Place is the building situated in the front on the Niagara Parkway below the Skylon Tower. 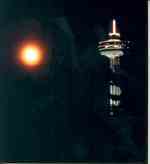 A night view of the Skylon Tower - Niagara Falls, Ont. The old Hydro Building on the corner of Murray St. & Buchanan Ave., Niagara Falls, Ont. The old scow in the Upper Niagara River with the Skylon Tower and the Sheraton on the Falls hotel in the background. 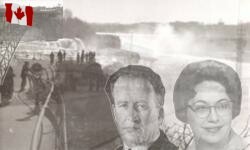 Used in the book Our Romantic Niagara by Albert H. Tiplin. 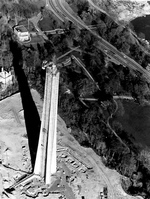 View of walkway, part of Niagara River Recreation Trail. 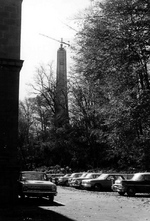 Skylon Tower in background. Pedestrian Walkway along the path of the old Canadian Pacific Railway Tracks along Victoria Avenue. 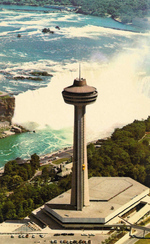 In the background the giant ferris wheel, the Skylon Tower and various hotels can be seen. Rainbow at the brink of the Horseshoe Falls, with the Skylon Tower, Niagara Sky Wheel, Sheraton on the Falls Hotel and Fallsview Casino Niagara in the background. Rainbow at the brink of Horseshoe Falls with Skylon tower in the background. 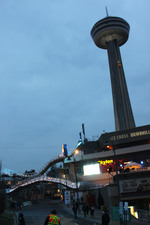 The Red Bull Crashed Ice course at the base of the Skylon Tower. 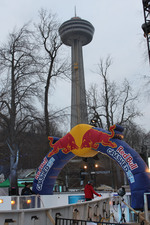 The starting gate of the Red Bull Crashed Ice course at the base of the Skylon Tower. Looking down Murray Street (Murray Hill) at the Red Bull Crashed Ice course. The American Falls can be seen in the background. The starting gate and upper track of the Red Bull Crashed Ice course at the base of the Skylon Tower. Red Bull Crashed Ice Finish Line. 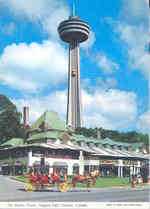 The Skylon Tower and the yellow bug elevator are visible in the background. The start of the Red Bull Crashed Ice course at the base of the Skylon Tower. The Red Bull Crashed Ice Course illuminated at night.The Skylon Tower with a sign "Ice Cross Downhill World Championship 2013" can be seen in the background. Red Bull Crashed Ice course going down Murray Hill from the Skylon Tower. The American Falls can be seen in the background. 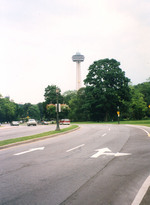 Looking at the base of the Skylon Tower from Murray Street (Murray Hill). 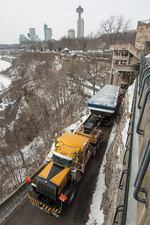 Construction is is progress for the Red Bull Crashed Ice race course, which starts at the Skylon Tower. 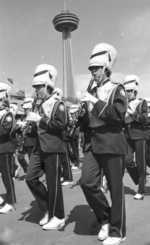 219 records found in Images database. Displaying 1 to 100.